A few months ago, I went to visit my friend Ellen in Virginia. I asked her if she could use my help with anything while I was there. Her response, "Sure. You could hold the ladder while I clean out the gutters." No problemo. I can hold a ladder. 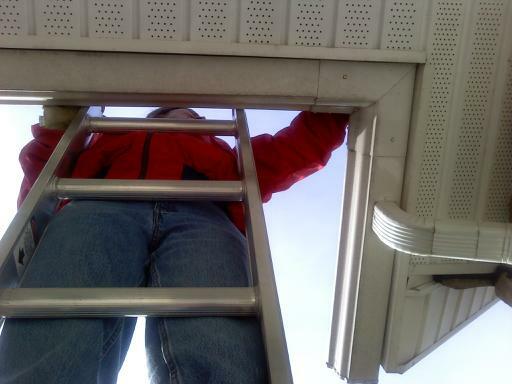 We took the ladder from the garage and set it up against the front of the house. There were a few sections where the ladder seemed to be a tad too short and there was Ellen, reaching far off the ladder to pull mounds of leaves out of her gutters. I'm barely thinking about what she's doing as I hold the ladder. After all... Ellen flies a medical helicopter for a living. Standing on the top of a ladder should be a piece of cake for her. All of a sudden I didn't want to be holding the ladder any more and I didn't want Ellen on top of that damned thing. My banter probably became quite irritating to her. "Do you have to get the leaves out of that farthest corner where you are reaching so far off the ladder?" "Can't you pay someone to do this?" "Why do leaves need to be removed from the gutters anyway?" "Can't you buy those plastic guards to keep the leaves out?" "I can't believe you are doing this..."
On and on I went. She said to me, "You don't have to hold the ladder if you don't want to. I don't need you to do it. I usually do this alone." "ALONE??? Argh!!! Dear God! What if you fell? What if you fell and broke your neck in the back of the house where no one would see you and you would just... you would just..." You get the picture. So what was my problem? Didn't I trust ME to hold the ladder once I found out that my friend was in the middle of facing her fear? Why was it no big deal before I knew she had a fear of heights? And why did I become so smotheringly protective? There was a big lesson to be learned that day - though I'm not quite sure I've figured it out yet. Sorry Ellen. At least you got the gutters clean. There a big difference between fear of heights and fear of falling. Don't confuse the two!